Billy Ray Herrin, 86, of Hector, died Wednesday, June 13, 2018 at Atkins Nursing & Rehab Center in Atkins. 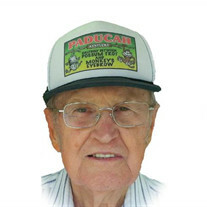 The son of Fred and Ruby Allen Herrin, he was born July 14, 1931 in Forester. He married Noma Davis, on December 15, 1951 at Forester, Arkansas. He was a United States Army Veteran of Korea. He was retired from Arkola Sand and Gravel company. Billy was a devoted husband, loving father and grandfather. Billy was a member of the Rehoboth Assembly of God and was an avid gardener and enjoyed hunting, fishing, singing, playing the guitar and prospecting. He was preceded in death by his parents; and two brothers, Gary Herrin and Larry Herrin. Billy is survived by his wife, Noma Herrin of Hector; a son, Terry Ray Herrin (Linda) of Kevil, KY; two daughters, Judy DellaPelle of Russellville; Beth Dodson (Aaron) of Hector; eight grandchildren; five great-grandchildren; sister Rose Smalling of Cedar Creek and other relatives and friends. Funeral Service will be 2:00PM Monday, June 18, 2018 at Cedar Creek Community Church. Rev. Phillip C. Collie II will officiate. Burial will be at Cedar Creek Cemetery in Cedar Creek (Scott County) by Humphrey Funeral Service. Visitation will be from 3:00 pm to 5:00 pm, on Sunday, at the funeral home. Memorials may be made to Arkansas Hospice,2405 E. Parkway Ste-3, Russellville, AR 72802. Internet obituary and on-line guest book are available at www.humphreyfuneral.com.